To get to the mobile Domain Overview, query a domain in the main search bar and select the mobile icon next to the domain name at the top of the report (see below). For a real-time look at what mobile databases are available, visit our statistics page. If you want to track mobile rankings in a country where we do not have a full mobile database, you can set up a Position Tracking campaign in your Projects. The top shows the total number of organic and paid advertising keywords the website has ranks for in Google’s mobile results. Next to these numbers is the Search Performance Trend, where you can identify any increases or decreases in the site’s number of keywords on mobile search results over time. You can add notes to any date in this trend chart to keep track of any significant dates that could have an effect on a domain’s search trend. You’ll probably also notice small Google icons on this chart. These indicate times when SEMrush saw Google make any significant change or update to its algorithm that could affect rankings. The following section is all about organic mobile search. 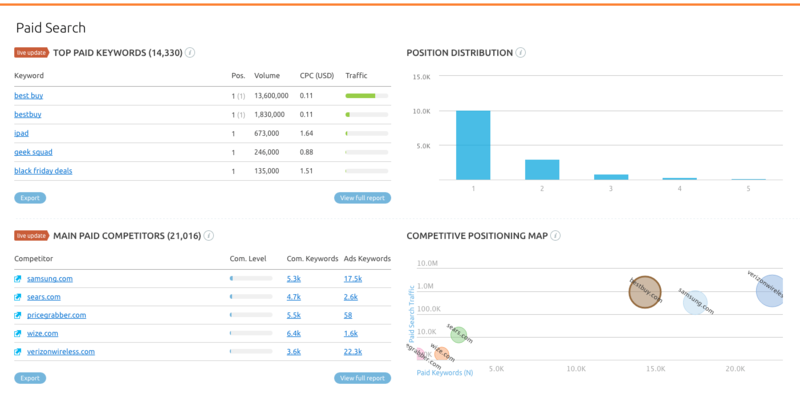 The domain’s top mobile keywords, distribution of positions, and mobile competitors can be analyzed quickly here. Top organic keywords - These are the top keywords that the website gets mobile search traffic from ranked by their percentage of traffic. The traffic represents the mobile keywords the site ranks for and the percentages are based on the desktop volumes of the keywords. Click “View full report” to see the domain’s complete list of mobile organic keywords. Position distribution (top 3, 4-10, 11-20) - These bars represent the amount of mobile rankings the website has in the top 3, 4-10, and 11-20th positions. A high amount of positions between 11-20 indicates room for optimization, and a high amount of positions in the top 3 indicates the domain is doing a good job optimizing its mobile website. Main organic competitors - These are the top five websites that compete with the domain for traffic from mobile search. The more mobile keywords they have in common, the more they compete with each other. Domains with a similar number of SE (search engine) keywords are more likely to be competitive with one another. Competitive positioning map (organic) - This map illustrates the spread of the domain’s competitors based on their number of mobile keywords and mobile search traffic. The larger the circle, the more visibility in mobile search results a domain has. The next section covers the keywords and competitors the domain has in paid mobile search results. Top paid keywords - This is where you’ll see the top five paid keywords bringing traffic to a website from mobile search PPC ads. Again, since SEMrush currently does not gather data mobile traffic percentages per keywords, the traffic percentage estimation is calculated based on desktop volume and average click through rate. Position distribution (1,2,3,4,5) - This graph illustrates the distribution of how well a domain’s mobile ads rank in the results. The more positions a domain has in the top 3, the more optimized their mobile PPC efforts are. Main paid competitors - This is where you can see a domain’s top five competitors based on their number of shared mobile keywords. Just like with organic competitors, when two domains have a similar number of paid mobile keywords, the more competitive they’ll be with one another. Click on a domain to open up their Domain Overview, or “View full report” to see the full list of competitors. Competitive positioning map (paid) - This map illustrates the spread of the domain’s mobile competitors based on their number of paid keywords and search traffic. The larger the circle, the more visibility the competitor has across the keywords that the queried domain has mobile ads on.